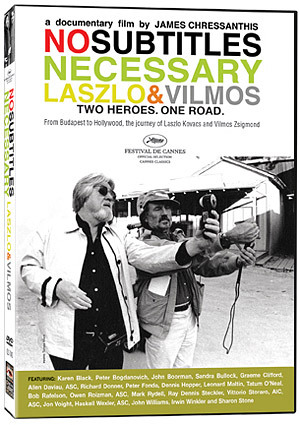 No Subtitles Necessary: Laszlo & Vilmos (Director: James Chressanthis): Only appearing on DVD now, this 2008 documentary explores the work of and friendship between two giants of cinematography. Laszlo Kovacs and Vilmos Zsigmond first met as students at film school in Budapest in the 1950s. Soon, they were caught up in the events of 1956, when Hungarians briefly revolted against their Communist government. As Soviet tanks rolled in to crush the rebellion, the two men took to the streets with their cameras to document events. When things calmed down, they knew they had to escape from Hungary, and their recollections of heading for the Austrian border with their film are harrowing, even though we know they made it. Upon their eventual arrival in America, they headed for Hollywood expecting to join the ASC (the cinematographers’ union) easily. When they were turned away and told cheekily to “come back when you can speak English,” they were undaunted. They quickly found work on all kinds of low-budget independent films, including those of Roger Corman. So when Peter Fonda and Dennis Hopper decided to make Easy Rider (1969), they hired Laszlo based on his previous work (including Peter Bogdanovich’s debut film Targets), and on his cheap (non-union) wages. The film’s success lifted all its creators, including Kovacs, out of obscurity, and he soon found work on other films of the burgeoning New Hollywood movement of the early 70s. When Peter Fonda wanted him for his next film, The Hired Hand (1971), he was already working on Paul Mazursky’s film Alex in Wonderland (1970), so he recommended his friend Vilmos Zsigmond (“call him Ziggy,” he told Fonda.) It was only after Fonda hired him that Vilmos confessed he’d never shot a colour film outdoors before. And this was only work they did in one decade! Remarkably, only Close Encounters of the Third Kind was recognized with an Oscar, for Zsigmond. It’s fitting that the film spends a lot of time on his experience on this film, since it was a tremendous lighting challenge, and he was allegedly fired five separate times. He says the only reason he finished the film was that no other cinematographer wanted to step in, such was the difficulty of getting the lighting just right. As films retreated from the innovations of the 1970s, both Zsigmond and Kovacs continued to get steady work, but as the paucity of clips from their later work indicates, never would they work in such innovative and creative ways again. Kovacs died in 2007, and the film ends shortly afterward. Though I enjoyed this documentary’s generous selection of clips, I found the interviews with both the men themselves and their admirers a bit lacking. We get very little insight into their ideas about working with images and light, or how they worked with different directors. And as with many talking head films, it’s the interviews that aren’t included that leave us wanting more. Because Close Encounters of the Third Kind was such a significant achievement for Zsigmond, it’s disappointing that the filmmakers couldn’t get an interview with Steven Spielberg. And though there is a very short interview with Haskell Wexler, surely there could have been more discussion of the mutual influence between the two Hungarians and other pioneering cinematographers of the time, like Wexler and Néstor Almendros. Another maddening thread is the teasing discussion of the marriages and family life of the two friends. Kovacs actually returned to Hungary shortly after their escape to rescue their girlfriends, whom they married immediately afterward. But these women are never mentioned again. Brief interviews with their current American wives aren’t enlightening on this front. Then there is the matter of Kovacs’ “secret” daughter, with whom he reconciles, but we never really hear the details of where she came from. If anything, these sections could have been edited out if they weren’t going to contribute to our understanding of the two subjects. As an appreciation of the work of two master cinematographers, the clips speak for themselves, but I wanted more from this documentary. As it stands, it does a good job of making the viewer want to seek out some of their lesser-known work, but it doesn’t shed much light on what made these two so special, or on the obvious and unshakeable bond between them. This entry was posted in Documentaries, DVD and tagged cinematographers, hungary. Bookmark the permalink.